Look to the north from almost anywhere in Reykjavik and you will see the graceful Mt. Esja watching over the city. Mt. Esja is without a doubt Reykjavik’s favorite mountain. It is very close to the city (only 20km) and it looks so inviting that it is hard not to wonder if it’s possible to hike it. 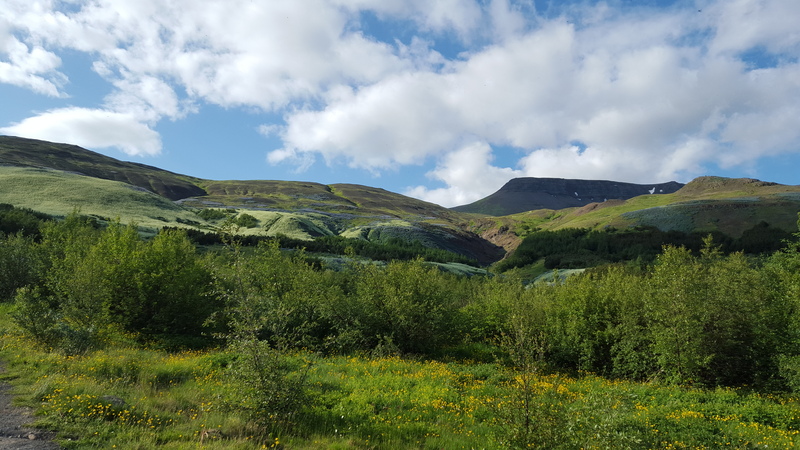 Esjan, as the mountain is called by us locals, is one of the most popular hiking destinations in Iceland. Many go there for the absolutely stunning view over Reykjavik but runners and other fitness enthusiasts also use it extensively for training purposes. Esja is just over 900m high and has several walking trails to the top. The path to Þverfellshorn is the main walking trail to the top and maybe the most crowded trail in Iceland. On a good day many hundreds will hike the trail, some go to the top but many turn around at the famous “Steinn”, like we do in this article. First things first. How do you get to Esja ? If you have a car, it couldn´t be simpler. Follow the main road in Reykjavik (Hringbraut/Miklubraut) out of town and into Mosfellsbær. 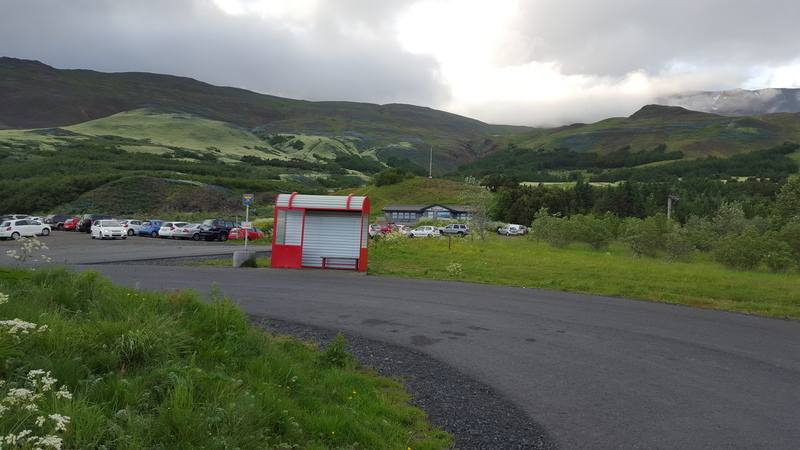 Drive for a minute or two, after that and you will be at the parking lot in Mógilsa at the foot of Esja. You won’t miss it, on a nice summer day there will be many cars parked there and Esjustofa cafe is in clear sight. If driving there is not an option, the bus (Stræto) is the next best thing. From Lækjartorg you can take nr. 6 to Ártún, where you have to change to nr. 57. In total, a trip from downtown Reykjavik to Esja should take about 45 minutes. It is advisable to check the schedule on www.straeto.is (the bus stop is called “Esjurætur”) because the 57 bus isn’t as frequent as the inner city buses. There is usually an hour or 90 minutes between buses and at the time of writing the latest one back leaves Esja daily at 22.25. Blue fields of lupine cover large part of the lower mountain with a birch forest and lots of wildflowers mixed in between. The blue of the lupines soon gives way to greener slopes but higher up the mountain and nearer to the top, the hills get rockier with every step. The path almost feels like a light stroll to begin with but soon starts to get steeper although the footpath has flatter parts inbetween where can catch your breath. The gravel trail is fairly smooth to begin with but less so higher up the mountain. The path is clearly marked and easy to follow. But even on the smoothest parts of the trail there are occasional rocks so watch your step! There are three small bridges and one small unbridged creek to cross. At about 240m height there are crossroads were you have two options. The trail to the left is shorter and steeper, the one to the right is more even and easier to walk or run. They converge later so it doesn’t really matter which way you choose. If we want to run on the descent we usually take the left on the way up and then the other way down..
At 600m height there is a famous landmark on Esja, a big rock called “Steinn” – almost a mandatory photo stop! “Steinn” means of course “Rock” in English. Steinn is also a man’s name in Icelandic, and rumour has it that babies of Esja-hiking mothers have been named after it. The walk to “Steinn” and back is just over 6 km. It is not simple to estimate how long a trip up to Steinn will take. It all depend on your fitness and of course how much time you want to have to enjoy the scenery. Those in top shape may get up to Steinn in around 45 minutes or less with a brisk walk, but it can also easily take twice that time. Many people turn around at Steinn, especially those who see this as a training session, as the rest of the route to Þverfellshorn is more of a climb than the hike up to this point. The journey to the top is not as straightforward as the rest of the trail, however, it is fairly easy to see which way to go and someone else will usually be there. Near the peak there are chains to assist during the most difficult part of the climb. It is not a technical climb, but you will have to you use your hands to it support you. This last leg can be challenging, especially in winter when it should really be avoided unless you have experience climbing in snow and ice. At the summit, stop for photos, sign the guestbook and marvel at the spectacular view before you head back to Steinn the same way you came. In June every year there is a trail race on Esjan, where participants run 2 or 11 times to Steinn and back! There are always runners on Mt. Esja. 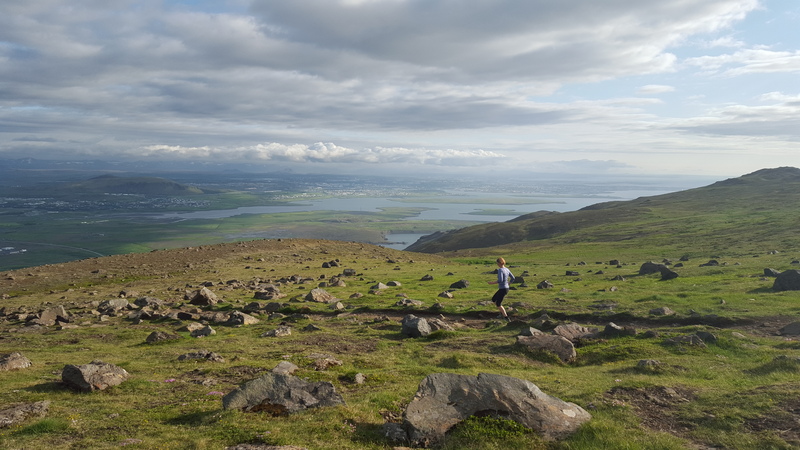 The hills are a bit too steep for running upwards for most people, but going down it is the perfect training area for the Laugavegur trail race and very popular as such. There are rocks on the path so you have to be very alert and careful, but it is definitely possible to run on the trails. On the route described here there is a very rocky part just below Steinn as you head down, before you cross the river for the first time at 383m height. That part of the trail is tough to run on, but after that it is plainer sailing. Unless you are going to Esja on one of those all too few perfect summer days, choosing what to wear on Esjan can be difficult. The one thing to keep in mind is that it is always colder and windier near the top of the mountain. The Icelandic weather is also notoriously unpredictable, so even on good days it makes sense to have warmer clothes in a backpack or at least wrapped around your waist. Rain and fog can also set in without notice, so another thing to bear in mind is to turn around when visibility starts to decline. In winter there will always be a lot of snow in Esjan and not advisable to go unless you have the right equipment and winter climbing experience.